Tickets for the 2019 reunion, planned for September 21st, 2019, are now available here. Thanks to Algonquin College for their financial support which will allow us to keep the price per ticket at $42. The event will take place at Algonquin College, Building D on Saturday, September 21st. Mix and mingle begins at 4:30 PM with a buffet supper at 6:15, followed by brief entertainment with an OBE theme. So please, come join us this year as we once again walk down memory lane. There are former and current staff members who would love to see you again. The popular silent auction will be held again this year with some traditional items (restaurant, hotel and service gift certificates,original art by local artists and gift baskets, to name just a few) so don't forget to bring your cheque book. If you would like to donate something (or have a friend who might have a service or product to donate) please contact either Carole Moult (cmoult@sympatico.ca) or Merri Legris (Merrilegris@rogers.com). 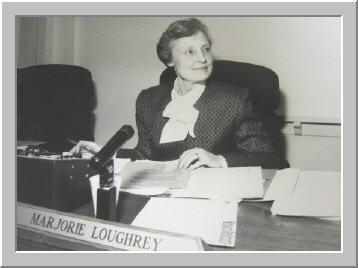 Marjorie made a significant contribution to education through her years as an Ottawa School Board Trustee. She believed that an education in the arts was fundamental to the emotional, intellectual and social development of each child, and this conviction led her to play a lead role in establishing the Canterbury School of the Arts. The award in her memory funds an artist to work for one week each year withall the students in one of Ottawa’s inner city elementary schools. The Education Foundation of Ottawa administers the annual award.